John Hay Goodlet was born in Leith, Scotland in 1835 the second son and one of eight children of George and Mary Goodlet (nee Hay). He was educated at the Edinburgh Institution for Languages and Mathematics. After he completed school he went to work for a time at the Edinburgh Roperie and Sailmaking Company in Leith. In 1852, not yet seventeen years of age, he left Scotland for Melbourne Australia arriving in June of that year. He found employment as a clerk in the firm of some fellow Scots, Charles and John Smith who were timber merchants. Within a year he was a partner in the business. In June of 1855, possibly due to a depression in the commercial scene in Melbourne, he went to Sydney and commenced a timber yard and saw mill in Erskine Street in partnership with the Smiths which was known as JH Goodlet and Company. The business did well and by early 1859 the partnership had been dissolved and another entered into with James Smith, a brother of his former partners, and in late 1860 the name of the firm was changed to that of Goodlet and Smith. In 1867 Goodlet and Smith expanded their interests and began producing bricks, pottery and earthenware in Riley Street, Sydney. In 1870 the site was expanded with state of the art labour saving machinery. By 1872 a Hoffman Annular Kiln had been installed and the works continued to produce earthenware until it was closed in 1915. In 1873 the Waterloo Brickworks were opened and operated until the mid 1890s. In 1884 Goodlet and Smith purchased the Junction Brick Works at Granville and later Goodlet showed his entrepreneurial attitudes by introducing the first successful colonial production of Marseille roof tiles. He also produced the first commercially viable high quality Portland cement at this site. All of Goodlet’s manufacturing activities were charactised by the use of up to date technology and labour saving devices. This enabled Goodlet to produce excellent products which sold well and produced good profits for the company. 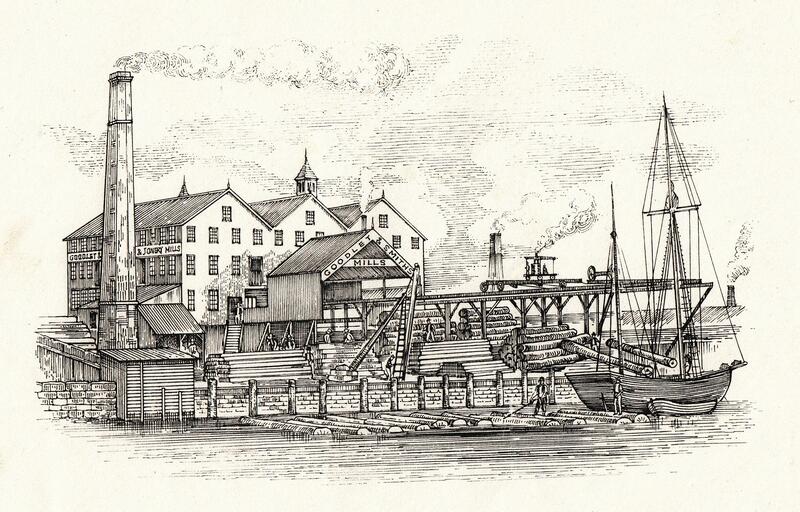 Timber remained a central part of the business and after the closure of the Erskine Street site a large saw mill, wharf and moulding works were opened at Murray Street Pyrmont in about 1872. In 1885 the timber milling business was relocated to the foot of Harris Street and remained in operation until 1927. Country saw mills were also maintained at Ulladulla and Cape Hawke from which a fleet of ships, owned by Goodlet and Smith, carried timber to the wharves at Pyrmont. Timber was also imported on Goodlet’s ship, the Nineveh, and other vessels from Canada, the Baltic, New Zealand and the United States. Glass was also sold but not produced by Goodlet and Smith being imported from Britain, Belgium and Germany. They did, however, commence the production of stained glass windows in 1888. A number of fine windows were produced in conjunction with Lucien Henry (Sydney Town Hall) and other Goodlet and Smith windows are to be found in Sydney Hospital, Central Railway Station, PLC Sydney and numerous churches in the colony of NSW. In 1882 James Smith retired from the firm and while Goodlet became the sole proprietor the Company continued to trade as Goodlet and Smith. In the 1890s, with the depression and the fall in demand for building materials, the company experienced financial difficulty. Prior to the onset of the economic slowdown Goodlet formed Goodlet and Smith as a limited liability public company with himself as managing Director, and his brother Alexander, his nephew James Clark and later his ‘adopted’ nephew Alexander Copeland as Directors. This farsighted or perhaps fortunate act allowed Goodlet and Smith to weather the difficult times and to invest heavily in equipment which allowed them to diversifying their manufacturing activities within the building supply trade. By the end of the century due to Goodlet’s excellent management the business had returned to prosperity. During this period the timber portion of the business declined in importance whereas the clay products portion became more important. It was as a brick and tile manufacturer that Goodlet and Smith were to gain prominence in the twentieth century. 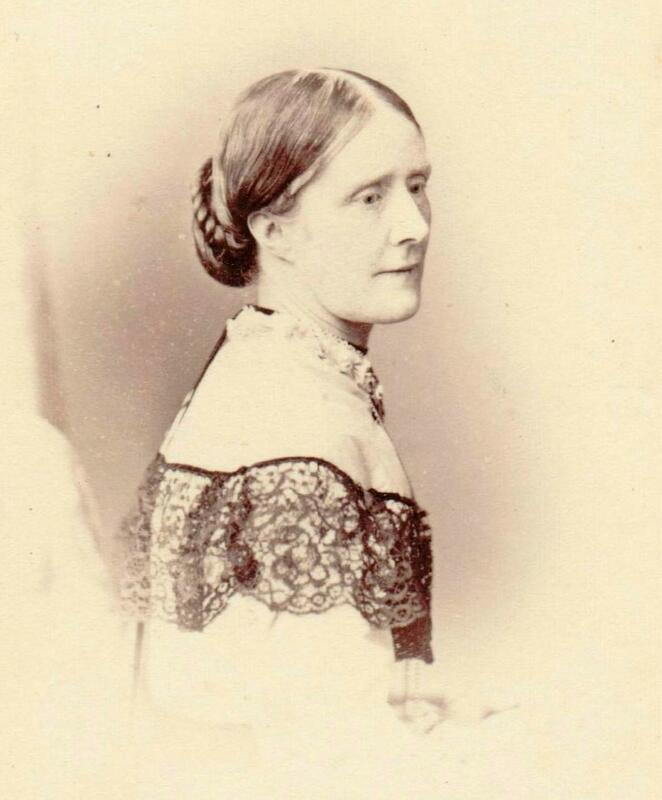 In 1860 Goodlet married Ann Alison Dickson (1822-1903) (nee Panton) a widow who was some thirteen years his senior. They made their home at Glebe, movingto Ashfield in 1872. 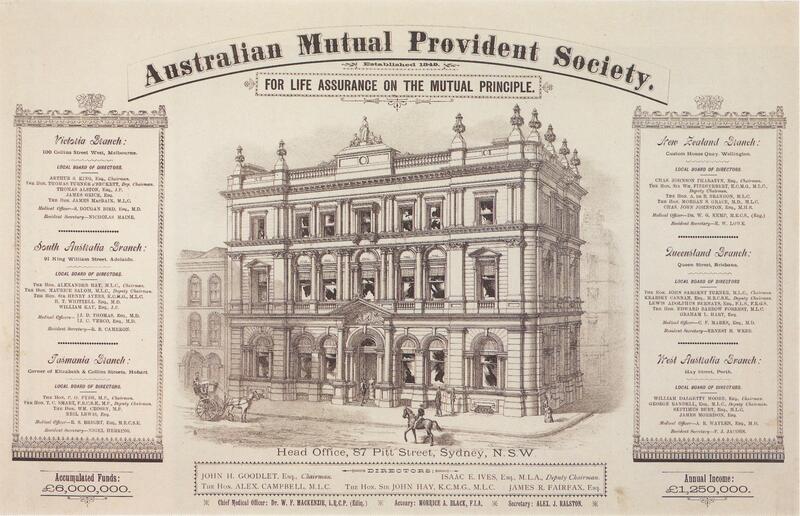 Goodlet purchased Canterbury House, Ashfield in 1882 and this became the Goodlet home. Ann was influential in directing and assisting Goodlet’s charitable interests and was very significant and respected figure in charitable circles. In 1903 Ann died and in 1904 Goodlet married Elizabeth Mary Forbes (1854-1926). Both marriages were childless and Goodlet himself died in 1914. Goodlet’s interests were varied. In 1860 he was in conjunction with others responsible for the formation of the Glebe Volunteer Rifles which was a group of citizen soldiers formed for the defence of the Colony of New South Wales. He was also appointed the Captain of the Glebe Volunteers at this time. In 1868 various companies were formed into Battalions and he was appointed Major of the Suburban Battalion. In 1872 he was appointed Lt Colonel and with the introduction of a paid force in 1878 he was appointed Lt Colonel commanding the Second Infantry Regiment. In 1886 he was made Brevet Colonel and he retired in 1893 with the rank of Colonel after serving as a citizen soldier for 33 years. Politically he was active in the Free Trade movement for most of his life however late in life he moderated his views due to the significant impact that tariff reduction had on his cement business. He was a strong supporter of Federation, upper house reform, income tax and the local option with compensation for hoteliers. He unsuccessfully ran for the NSW Parliament in 1895. The Presbyterian Church was his primary interest and his charitable activities and his life and values were motived by a strong evangelical Christian faith. At the local church level Goodlet was an elder successively of Philips Street United Presbyterian Church, St Stephen’s Presbyterian Church and Ashfield Presbyterian Church. When he moved to Ashfield he became Superintendent of the Sunday School, a position he held for over 20 years. He donated large sums of money to the erection of a Church building and a Sunday School Hall Complex which, after his death, was called the Goodlet Institute. He was an Elder to the General Assembly of the Presbyterian Church in NSW from 1868-1913, a founding Member of St Andrews College, Sydney University on whose board he served from 1870-1913. He was also a founding member of the Presbyterian Ladies College, Sydney on whose board he served from its founding in 1888 until his death. He was a member of the Dayspring Board, a maritime missionary association for 40 years. He was interested in missions and funded the building of a hospital for Women in Sholinghur in India. He was a Director of AMP from 1866-1886 and its chairman from 1883-1886, a founding member of the Sydney City Mission, a director of the Deaf & Dumb & Blind Institute from 1879-1914 and its President 1910-1914,. 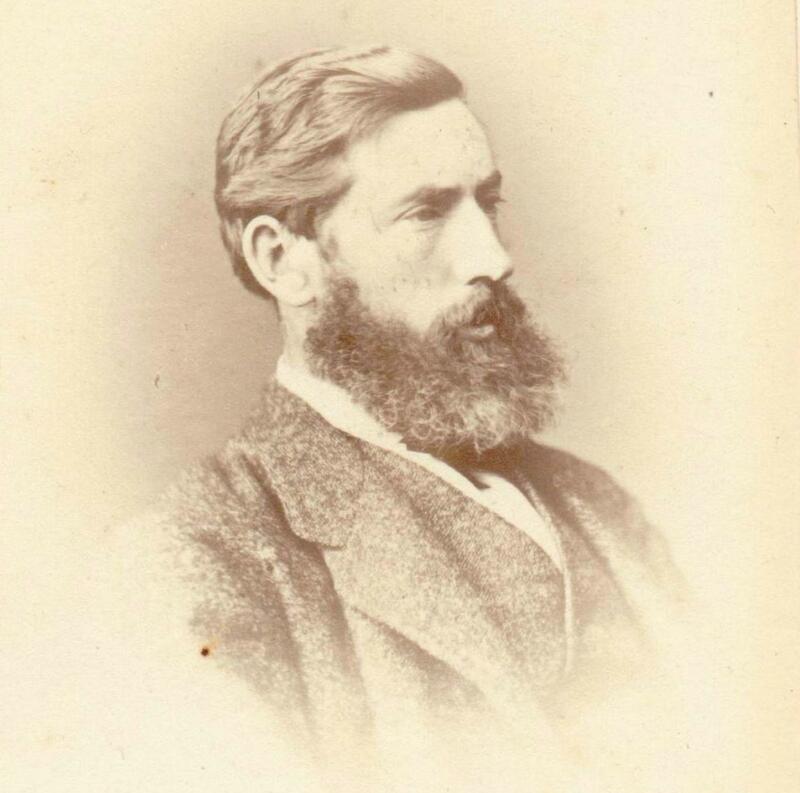 He was also a member of the Ragged Schools organising committee 1875-1896, a member of the Highland Society and its President 1892-4, Treasurer of YMCA 1878-1914, a member of the Sydney Hospital Board 1863-38, 1899-1914, a committee member of the Sydney Female Refuge Society 1862-1914 and a member of the Council of the Agricultural Society 1870-1873. He maintained a free private hospital at Picton for poor consumptives from 1877-1893 staffed by Isabella Price as matron. Initially he leased a hotel in Picton but due to increased demand for beds he paid for the construction of a purpose built facility which was opened in 1886. By 1892 Goodlet was not able to fund this work and in 1893 it became a public charity. In 1905 he donated the hospital and grounds to the Queen Victoria Consumptive Hospital and sold the remainder of the estate to the charity for well below its true value. During his lifetime Goodlet had generously supported numerous charities for long periods of time both with his money and his personal interest and involvement. At his death he left most of his estate of £92,000 ($9.6 million in to-day’s value) to various charitable organisations. His generosity during his life time is hard to determine but from fragmentary extant records it was some £100,456 ($12.55 million in to-day’s value) but there is little doubt that he gave far more than this figure as his giving was done without seeking public acknowledgement. Because of his personal charitable involvement and his significant financial donations he was designated at his death as Sydney’s Greatest Christian Philanthropist. Dr Paul F Cooper, Research Fellow, Christ College, Sydney. By phinaucohi in Philanthropy on April 21, 2016 .